Let me first start by saying I’m sorry you have to go through with this! I know it must feel scary and frustrating, but the good news is that most of you don’t have to have diabetes forever! As a patient of mine once said with determination, “I ate my way into this and I’m going to eat my way out of it!” Diabetes education traditionally teaches carb counting or food combining but this post will look at diabetes from a different perspective because not only can you prevent diabetes with your lifestyle choices but in most cases you can even reverse your diabetes too! Reverse your diabetes in 16 DAYS??? The answer is not more protein and less carbohydrates, the answer is actually more GOOD carbohydrates like beans, potatoes, vegetables, whole unprocessed grains (like oatmeal, brown rice, and quinoa), and fruit (when combined with beans in the same meal). The BEST food you could possibly eat is beans. Most patients are told NOT to eat beans because they are considered carbs. This is a travesty as beans and legumes are some of the best things you can eat (especially as a diabetic)! More and more research shows that eating beans is an important part of a healthy diet (they are even linked with longevity)! 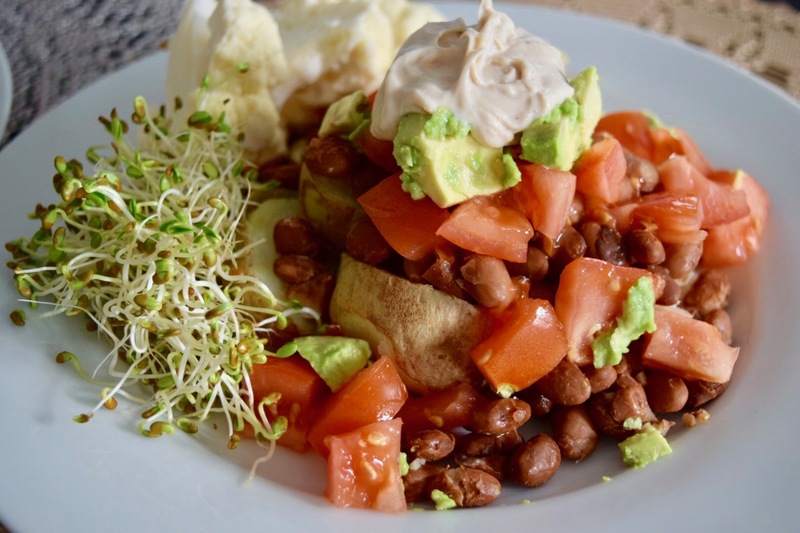 Beans have so much fiber and healthy plant protein that they help to stabilize the blood sugar not only immediately after eating them, but even during the next meal! Bottom line, fiber is the best thing you can eat for health. 96% of Americans do not eat enough fiber from whole foods and while protein is important for our health, most of us eat way too much and the protein we eat (from animal sources) does not contain any fiber (which is only found in plant foods). Instead of focusing on getting enough protein, start eating enough fiber from whole plant foods everyday. Plus, if you eat enough fiber from beans, vegetables and whole unprocessed grains (oatmeal, quinoa, brown rice) then you will get the right amount of protein (not too little and not too much) . Whether you struggle with chronic disease or just want to prevent it from happening fiber, from eating whole plant foods (beans, whole unprocessed grains, vegetables, fruits, and some nuts and seeds), should be the foundation of your food habits. Why not try it? Try it for five days. How about for the next 5 days eat all the vegetables, beans, fruits, and whole unprocessed grains you need to feel satisfied with every meal. Whether raw, steamed, baked, or boiled start with your favorites and get creative. Avoid sugar, salt, oil, and other processed foods and seasonings. Instead use cinnamon, ginger, curry powder and other salt-free seasonings to flavor your food. This 5-day reboot is designed to help you change your taste buds. Enjoy the next five days, as it will be easy to prepare and by the end of it your pallet will change and you will start to feel lighter and more energetic. You may feel like the fog has lifted and your brain is more alive! Then you can be a little more relaxed with your food choices. Try this simple 3-Day Meal Plan (Click Here). For best results make sure to drink lots of water, get enough sleep every night, and reduce stress. The 2 most important lifestyle changes you can make today is to starting eating ½ cup of beans with every meal (3x/day) and walk (or exercise) for at least 10 minutes after each meal (3x/day). You can do it. You can change your lifestyle. You can beat this diagnosis! You don’t have to stay this way. You are more than your choices, habits, and cravings.